EmuLa v1.7 is here for all of you, fellow followers! I’m happy to say that EmuLa v1.7 is available for download, people that have already installed EmuLa on their machines have to hit the [UPDATE] button and they are done! But what’s new in this version? This version fixes a bug that was raised especially on AROS builds just after an update and related to the preferences file: now it is fixed. License server and update server are no more hardcoded, this means that they can be updated and changed easily and in no time in case of down times or service provider change. Now EmuLa will remember its main window position and size. Now you can quickly reset to the default main window’s position and size holding down the Right Shift button while EmuLa is loading. Added support for skinning label gadgets. 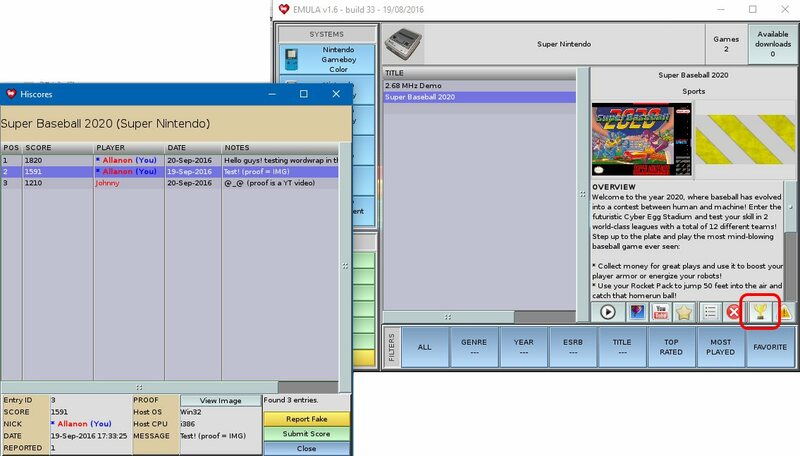 The SuperNES ROMs database has been completed, now EmuLa recognizes 2707 ROMs! But the biggest new feature is that the program is able to manage highscores for EVERY supported roms! You can retrieve highscores for a given game, submit your own scores and report for possible fakes. All you have to do is to proof your score with an URL pointing to an image or a video that proofs your score! This features is available for all premium users. Please share your thoughts and if you have suggestion please drop me a message, I will be happy to improve EmuLa with your ideas. A note to the AROS users : if you are installing this new package remember to hit the [UPDATE] button to get a last minute addition that enable you to run Genesis ROMS. Thanks to Yannick for fixing AROS DGen port! Previous Post Previous post: EmuLa v1.6 released, what’s new? Next Post Next post: I’m on Patreon!